I've begun this post about four different times now. And each time I've deleted everything, leaving me to just stare at the blinking cursor on the page. And it's not because I disliked Berlin, or that I don't have anything to say about it. In fact, it's quite the opposite — I LOVED Berlin, and feel like I could write a whole month's worth of posts about this fascinating city. But the world doesn't really need another blog post about Hitler, does it? It's tricky, writing about Berlin. How can I – an outsider – sum up where the city has been and where it is going in a few hundred words? The truth is, I can't. Yes, I could rattle on about Berlin's history. About how the city was thrown into economic turmoil after WWI. How, by 1923, $1 was equal to about 4.2 billion Deutschmarks because of outrageous inflation. How the economic and political volatility of the post-war Weimar Republic paved the way for Hitler and his extreme Nazi party to gain popularity. How the mysterious burning of the German Reichstag building in 1933 basically gave Hitler the power he needed to take over Germany. How Berlin suffered during WWII, when 80% of the city center and 200,000 civilian lives were lost during the 10-day Battle of Berlin. How the city was divided between the East and West after the war in a way that, even today, it has not quite recovered from. You probably already know a bit about this history; about Hitler and the Nazis, about the Soviets and the Berlin Wall. These are all things we learn about in school and see on History Channel specials — even in America. But you don't really get it until you see Berlin for yourself. Berlin is a scarred city – both physically and mentally. 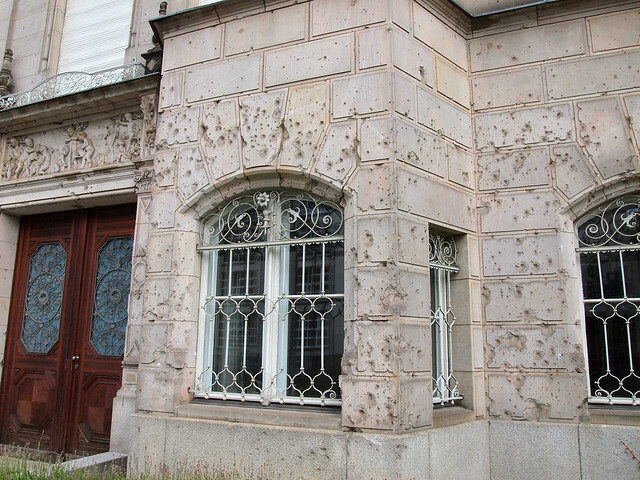 Some buildings still bear marks from that bloody 10-day battle in 1945 when 8 million rounds of ammunition were unloaded into them. And plenty of people bear scars here, too — but most of them are unseen to the naked eye. “I would never, ever say that I am proud to be German,” Julia, my Urban Adventures guide, tells my small group as we sit on stones at the Memorial to the Murdered Jews of Europe. Someone in our group has just asked her if there is still guilt felt by the average German over the events of WWII. After some thought, this is how the 30-something responds. Having grown up in West Berlin during the Cold War, Julia describes to us the typical education children received — plenty of lessons on the Third Reich and an emphasis on responsibility. The guilt isn't quite taught, she tells us, but it's almost implied. But scars imply that some healing has taken place. And I think it has. While the older generation is still looking behind and feeling guilty for Germany's actions during WWII, and the Cold War generation is still feeling the sting of separation, Berlin's younger generation is clearly ready to move on. The moving on will not take place overnight, of course. After all, it's only been 23 years since the Berlin Wall was torn down and Germany was once again reunited after 28 years of intense separation. But Berlin IS nevertheless making some massive strides forward. Walk down any street in Berlin and you will see signs of construction. Julia says there has always been a lot of construction in Berlin — even back before the wars — but I see it as almost symbolic. 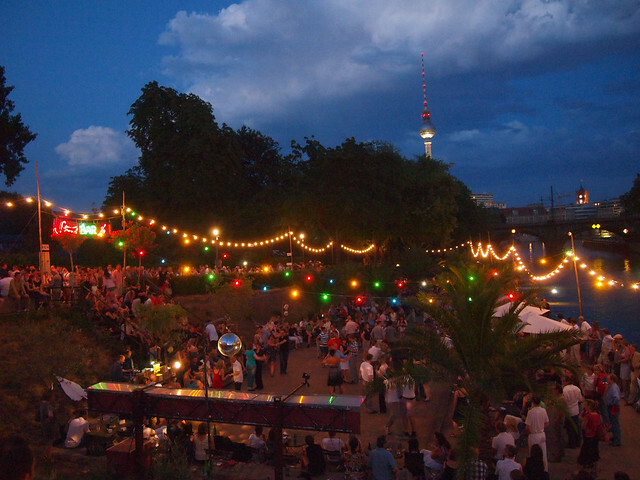 Berlin is rebuilding and reinventing itself. This re-invention is thanks mostly to that younger generation I mentioned; the one that wants to move forward. Head over to the hip and alternative Kreuzberg neighborhood to get a taste of Berlin's young, creative side. Hit up a beach bar or perhaps an underground warehouse rave. Take in vibrant street art, have a picnic in Görlitzer Park, and maybe even stumble upon an impromptu dance party at a U-Bahn station on a weekend night. 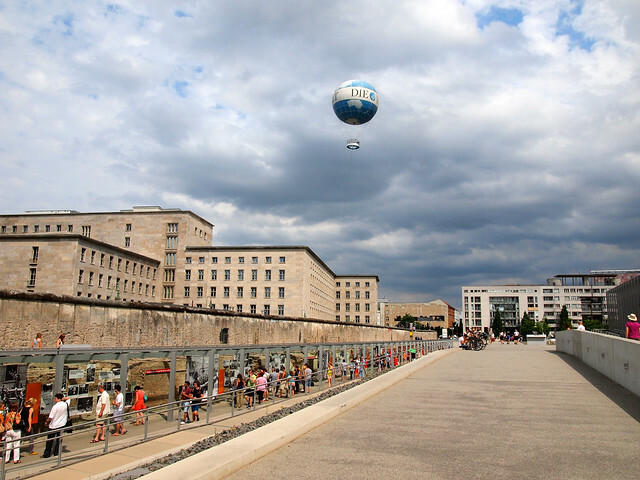 Visit these parts of Berlin, and you will realize that Berlin is much more than its past. I still haven't quite found the right words to describe Berlin. Maybe the right words don't even exist — or at least don't exist yet. All I can tell you is that yes, Berlin has been through a lot. And yes, many of its scars are still visible. But Berlin is going somewhere; somewhere interesting and exciting. The city has a vibe to it that I immediately connected with, and I'm already looking forward to going back some day. Have YOU been to Berlin? If so, what did you think of the city? *Note: I visited Berlin as part of my Busabout trip around Europe. They provided me with transport on all 3 of their Europe loops, but all opinions of the destinations I visit are entirely my own! Additionally, the Urban Adventures tour I mentioned in this post (“Storyline of Berlin“) was also provided to me free of charge. Hey Amanda, I really liked this post! The ones that are hard to write are always the best. I’ve been in Berlin a couple of times recently too but haven’t written about it properly yet because it is a tricky one. Love the city tho, but that might just be because the Germans are great fun and keep on surprising me. Thanks, Peter! It took almost a week to finish this one, but I think it sums up my Berlin experience as best as it could. I really really loved it. Glad you could admit how difficult it was to write this. Yet I see youth everywhere as being the solution to many world problems. Haven’t been to Berlin yet, but it’s on my list. Nice piece. Very insightful. Thanks, Gaelyn. I hope you eventually make it to Berlin to experience the city for yourself. I agree with you though that youth are often the solution! If they can get off their smartphones long enough to do anything… hahaha. what you wrote about Berlin is exactly the reason why this city fascinates me so much. Recent history is so widely seen there around each corner. It’s also amazing how fast the city changes! I used to live there back in 2007 and ever since I keep visiting it fairly often, each time I’m surprised how some places look totally different or how there are constantly new constructions in progress… now, after reading your impressions from Berlin I’m really curious how you’ll find Warsaw when you visit! Glad you can understand, and that Berlin makes you feel the same way, Kami. I’m interested to see what I make of Warsaw, too! I’m German, but I haven’t been to Berlin yet and it’s also not on my list to be honest. I don’t live in Germany anymore. For the past 6 years I’ve called Japan my home. I mention this because it was VERY interesting for me to see how different Japan treats their role and their sins in WWII compared to Germany. It’s like day and night. I don’t feel ashamed to be German, but it’s true that I can’t really say I’m proud to be German. I’m in my 30s, so I grew up in a time where Germany was not united. Luckily I grew up in Western Germany and I remember watching the wall coming down on TV. We learned a lot about WWII and the sins we’ve committed in school. It’s true that none of the teachers would ever directly say that it’s our fault and we should feel guilty, but it’s definitely implied and you just can’t help it. You WILL feel bad, you will feel guilty. With the younger generation it’s certainly different. Germany is slowly getting back its national pride, but in a healthy way. Hi there! So glad to read your comment to this post. I am very interested in learning about how the Japanese handle and teach their role in WWII. As an educator I’ve always been impressed with the way the German education system has handled WWII. How do you think the Japanese way has affected the younger Japanese? Does it seem that they carry guilt with them? And a personal note, how exciting that you now live in Japan. I am from the States and now live in Thailand. Those are just my impressions, but Japan certainly doesn’t have that feeling of guilt. I was really surprised because I expected a rant about how evil Americans were to drop the bomb on innoccent Japanese people. It is well-known that Japan tends to not admit their sins during war. This is especially true with their neighbors China and Korea. They’re disputing about war sins even nowadays. I don’t know exactly what Japanese students learn in school about WWII nowadays, but I’m quite sure that they also don’t learn how “bad” Germany’s role was in all of that. A lot of people are thrilled when they hear I’m from Germany, especially the older generation. Also, some Japanese people don’t quite understand why for us Hitler was such a bad person. Recently a Japanese politician said something really stupid concerning Hitler. I can’t really remember what it was, but it was something good about what he did. It does happen that some Japanese are idealizing what happened in Germany during the “Hitler era”. Of course, not the killing, but other things like the nationalism, the uniforms etc. So interesting to hear your perspective – and to hear how Germany differs from Japan in this respect. The whole not being proud to be German thing was news to me, actually, but I can understand how you would come to that feeling after talking to people in Berlin. It sounds crazy to me, too, Lauren – to not be proud of the country you grew up in. But Germany is very complex; I can’t even say I completely understand it, but delving deeper into Berlin definitely helped me begin to get a grasp on things. Berlin was a amazing place to visit. I was there in 2007. There was a buzz to the whole place. Definitely still a “buzz” there, Steve. I loved it almost immediately. Lovely post Amanda, I really love how you infused an already known history into a revitalizing post about the healing of the city. I remember reading a book by Paul Theroux as he traveled through Berlin post WWII, nd how it was so grey. And those are the images conjured when I think of Berlin growing up learning about it in school. Always black and white and grey photos, always about the war. 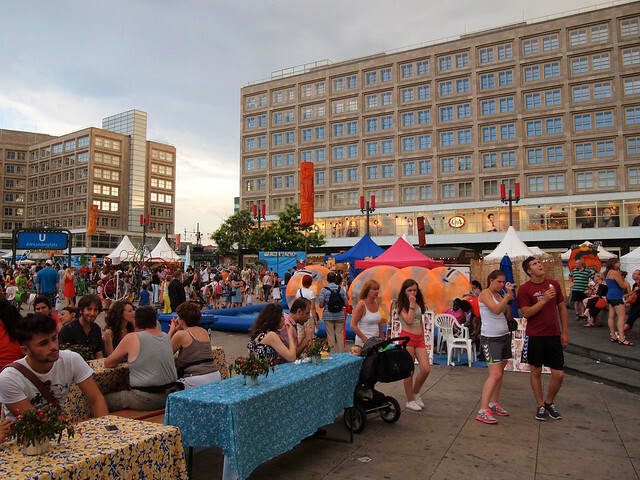 So happy to see Berlin re-inventing and healing itself with liveliness and vibrancy! Berlin has definitely come a long way since Theroux was writing about it. It’s such a interesting city! I went to Berlin when I was seventeen and loved it. So much history packed into such a (now) modern city. So youthful and lively! My guide did tell us though that children were taught in school to feel a sense of guilt and shame for the the actions of their grandparents and great grandparents. It’s just crazy to me that kids are basically taught to feel guilty. I’m not saying they shouldn’t learn about Germany’s role in WWII. But I think it’s taking it a bit far to still be teaching kids to feel bad about it! I’m dying to visit! Awesome shots!! You absolutely should visit, Andi! Fantastic post! Very much enjoyed your take on Berlin. I lived in Berlin for 3 years and volunteered at Aktion Suehnezeichen Friedensdienste (Action Reconcilation Service for Peace) that has worked hard ever since the 50’s to show a “sign of atonement” for the Nazi era, sending German volunteers to other countries and working directly with populations affected by the Nazis, namely Jewish, homosexuals, Sinti and Roma and the mentally-challenged. I also volunteered with the Jewish Community, visiting the elderly and helping them with things around the house and necessary errands like shopping. Much work has been done to “apologize” for the war and the actions just before it. The third generation now, however, having of course nothing to do with the Nazi era, is carrying this burden of guilt. While it is excellent that the German education system is taking the responsibility of the Nazi era very seriously, the underlying message of “we are guilty” is very misplaced. It’s a shame that the only German history known to the world is that of the Nazis. When in fact, just a short train ride outside of Berlin, you can visit the place that Martin Luther posted his 95 grievances against the Catholic Church, revolutionizing the world. You can visit Weimar where Goethe and Schiller thrived. There is SO much Germans have to be proud of both historically and today. It’s not fair that so many people only focus on one era in Germany’s past in particular. It is my opinion, after learning and speaking with teenagers in Berlin that the undeserved guilt that was handed them by the generation before has led many to join neo-Nazi parties as a response, as if saying, “screw you. I’m not going to be guilty for your mistake.” I can’t say that the teenagers I spoke with represented all young neo-Nazis but it did for them. SUCH a great comment; thanks so much for taking the time to post this. I loved this bit: “the underlying message of ‘we are guilty’ is very misplaced.” I absolutely agree. Like you mentioned, there are so many things for Germans to be proud of. It’s about time they start recognizing them themselves. Whenever I meet a German, I NEVER think of WWII or Hitler or the Nazis first. There’s so much more to Germany than all of that. This is such a beautiful post! A large part of my heritage is German, and so my Grandma and I have always spoken about taking a trip to Germany. Berlin is one of those places on our list. This is seriously a beautiful way of thinking about the city. Thank you for writing it! Well thank you for reading it, Amanda! Berlin would be a great place for you and your grandma to go. It’s SO full of history. I love love love Berlin. It may in fact be my favourite European city, hands down. The thing about guilt: I find it really sad and slightly incomprehensible that Germans in their 30s and younger would feel guilty about something that happened before they were born. Not to imply that those who were around at the time of WWII *should* feel guilty (they shouldn’t). Maybe it’s because it’s still so fresh. I don’t, for example, as a British citizen, feel personally guilty about the millions of people murdered and enslaved as a result of rule under the British empire over the last however many hundred years. Hopefully, moving to Germany next year (maybe?) will help me get a better understanding of why people still feel this. It’s incomprehensible to me, too, Sam. It’s like… as an American, I don’t feel personally guilty about slavery in the United States, even though my family believes we probably had slave-owners in our ancestry generations ago. I feel SAD that slavery ever happened and I feel that it’s an important topic to learn about and understand. But guilt? No, there’s none of that simply because there shouldn’t be. It will be interesting to see how Germans feel about all of this 2 or 3 generations from now! You’ve alluded to some of the reasons why I, as a Canadian and unabashed Germanophile, feel a little defensive about Germany and its people. I think and I’ve told my friends they have a lot to be proud. Yes, it’s a complicated country and a complicated people, but some of my best friends are in the D-land, and I make every effort to go back to my second home. I just left Berlin after a short visit, and it was tremendously bittersweet to leave. Thanks for your post, Amanda. Thanks for your lovely comment, Henry. I’m glad to have captured a little bit of the essence that is Berlin and Germany. Love the thought and care you’ve put into this post. I can understand your thoughts – similar to mine when we were there – and I wondered if the city ever tires of itself. Do the people tire of our questions related to the war? Is Berlin tired of being associated with its past? In a couple of generations so much of it may be forgotten, which is good, but also not. I wonder those same things, Dalene. Though, with how much Berlins past is thrown at it, I would imagine that most people are used to the questions. It definitely will be interested to see what the city is like 20 or 30 years from now, though. I always hear people say they either loved Berlin or hated it. I was there for the first time properly in March this year and I loved it! It is full of history and I love that it has been a melting pot of all sorts of races and cultures. It’s like it is defying its past. Yes! I automatically loved it, too. It just has this vibe about it that I connected with almost as soon as I stepped off the bus. I really enjoyed this post! I haven’t been to Berlin yet, but you beautifully expressed some of the questions I’ve had regarding German guilt and healing. I can’t wait to go experience the place for myself! I really hope you get to, Heather. It’s swiftly become one of my favorite cities in Europe! Berlin is such a complicated and amazing city – I’m so glad I got so show you a little bit of it while you were here. And I’m even more glad that you came away impressed with the city! It was great seeing you and seeing a bit of “your” Berlin. I definitely loved the city! I adore Berlin: I was there in 2008. I cannot wait to go back. Very interesting points on the feelings of guilt. My grandparents are German and when they came to Canada, I never got the sense that they weren’t proud to be German but they really embraced Canada. They never taught their children German and things like that. But as a historian, history is about never forgetting what happened so it can never repeat itself. You should not put the sins of the past on the present. I find myself trumpeting Germany far more than Germans themselves: patriotism is downplayed but it should not. Their history is not solely one based on Nazism; there is so much more. Over a thousand years of wonderful history…..I wish people would focus more on that. But yes, Berlin is a wonderful city. I love that it is starting to thrive. It IS great to see Berlin beginning to thrive. Maybe a generation or two from now, German will start to be proud again. Oh boy, I love Berlin. It was the first time I went to a foreign country alone to meet people I only knew through the internet. It was fantastic. We did so much and had such a great time. One of the people I met was German living in Berlin and I had a conversation with her a year or so ago about what they’re taught about the war and so on. I just found it interesting to know, as it must be very difficult. I think there is some guilt in there, but also an incredible determination that this will never happen again. That is one of the things that came across to me both in Berlin, and in Munich when I visited. 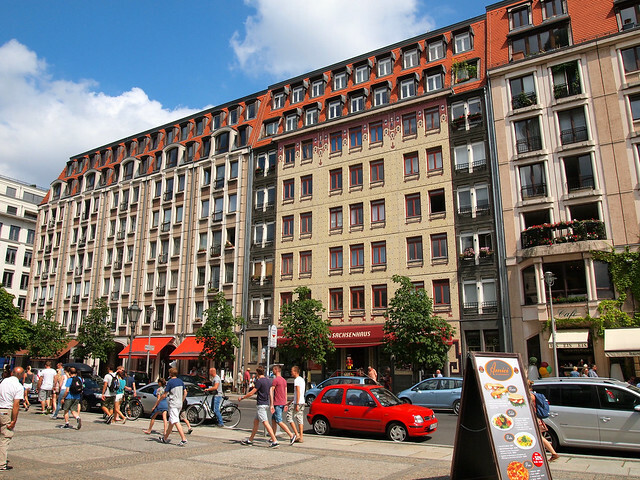 We stayed on the east side of Berlin and it was beautiful, and cheap, and interesting. I loved it there, but as soon as we crossed into the West Side of Berlin it was an obvious change in the buildings you could see it! It was strange, but incredible. Our friend also still explains whereabouts things are in Berlin firstly by whether its in West or East Germany, even now all this time after the wall has been pulled down. It really is a fascinating place, and I’m glad to hear you enjoyed it, too! This is a really informative post about Berlin. Well done! I live in Berlin and I absolutely love it. Yes, it’s history is a complicated one but that should not deter people from seeing other things too: the language, culture, art and the people. I volunteered to be a stadium hostess during the FIFA World Cup and I was so proud to be wearing the German and British flag on my jacket showing the world the NEW BERLIN! That’s great to hear, Victoria, and I’m really glad you liked this post! 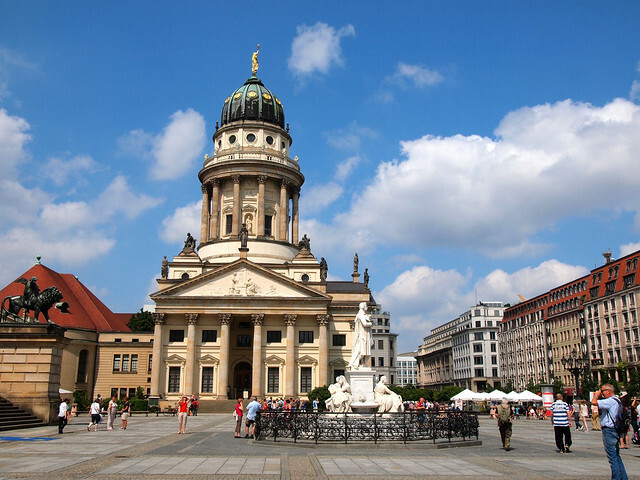 Loved Berlin – a city taking its history with it. Memorable things: the Stasi HQ as they left it in 1989; the tiny circular chapel midway along the Wall Memorial where at noon each day there is a short, simple but moving service; and the Komische Oper performance of Mazeppa. Lots more of course. It’s such an interesting city! Hi! I loved the post. I’m moving to London in 2 weeks and I’m considering going to Berlin as my first solo-trip. Is Berlin a safe city? Would you recommend it? Berlin is no more safe or unsafe than London! 🙂 It’s a really cool city, and pretty easy to get around using public transportation. If you’re a history geek like me, you will love it! 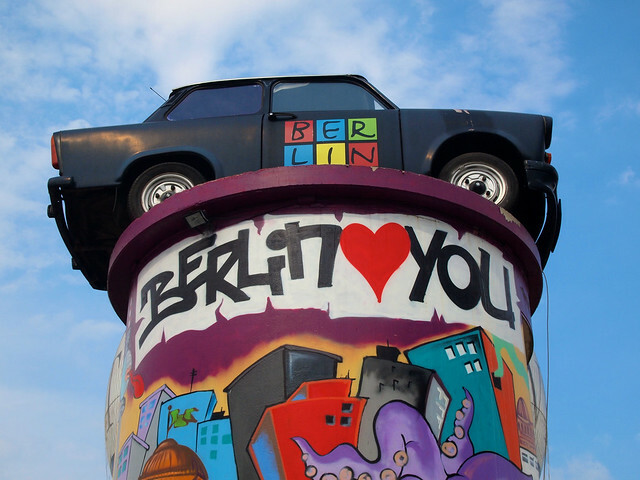 Hey Amanda, just saw your blog:) I’m german and loved the things you’re writing about Berlin. I love the city, it’s so young and full of life! I’m really curious about your next journey ? Thanks, Charles! Berlin is definitely a cool city – probably one of my favorites in Europe! Berlin Jan 30, 2016 to Feb 3. My 25 yr old daughter had a business trip to Prague the week before. She followed this with a week of vacation. I vacationed with her during these two weeks. She chose to visit Berlin and Munich following Prague. Berlin wasn’t my choice and I probably would never have visited the city if not for her. 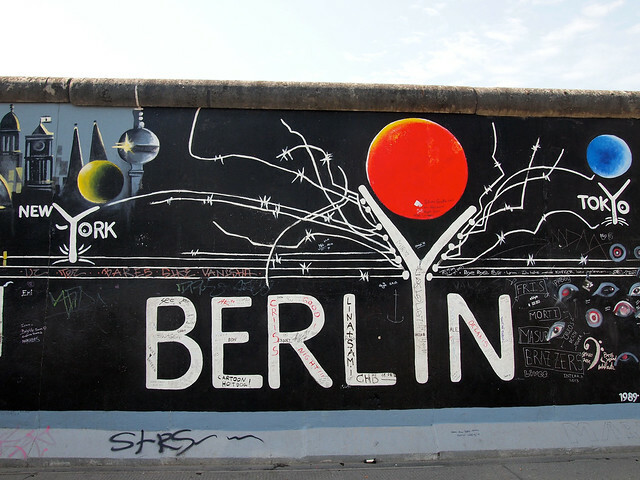 I used the Lonely Planet Berlin guide, trip reports and blogs for background. I’m not sure why but the prospect of visiting Berlin excited me much more so than Prague or Munich. Maybe it had something to do with the fact that it was hard to get a handle on. Even after our visit I still feel it’s hard to sum up the history, art, architecture, culture, food, neighborhoods, events that surround you. On Tuesday night as we packed up for our morning flight we had a beautiful view of the Sony Center and saw a red carpet event in process. We went down to check it out and got to experience a movie premier with all the Hollywood glitz. Zoolander 2 – selfies with Owen Wilson and Justin Thereuo (sp), and even got free tickets to the premier that required we walk the red carpet to get into the theater. So what can you say about Berlin. How do you blog about the heart wrenching experience of The Memorial to the Murdered Jews and the premier of Zoolander 2. The pieces don’t fit and it doesn’t make sense but that was what happened on our visit. I totally understand, though! Berlin is such an interesting city with so many contrasts. That’s what I loved best about it, though!